Nusra Front and allied jihadists storm Division 13 weapons depot, seize US-made TOW anti-tank missiles. 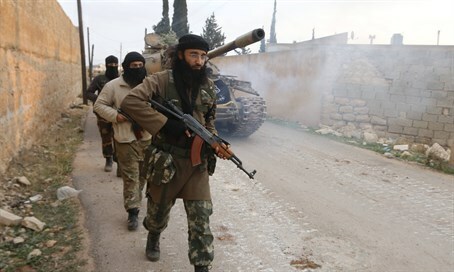 Al-Qaeda fighters and allied jihadists clashed with a western-backed rebel faction overnight in northwestern Syria after storming its weapons depot, the group and a monitor said Sunday. In Tweets posted Sunday morning, Division 13 said it had failed to push back an attack by Al-Qaeda's Syrian affiliate, Al-Nusra Front, and allied faction Jund al-Aqsa. Division 13 said the jihadists "raided all our bases and looted our weapons and equipment" in the town of Maarat al-Numan in Idlib province. "We congratulate (Al-Nusra chief Mohammad) al-Jolani on this conquest!" the group posted sarcastically on Twitter. According to the Syrian Observatory for Human Rights monitoring group, the clashes left at least six combatants dead, four of them identified as Division 13 fighters. "Al-Nusra and Jund al-Aqsa kidnapped at least 40 members of Division 13, whose commander has gone missing," Observatory head Rami Abdel Rahman told AFP. He said the jihadists had cleared out Division 13's depots in Maarat al-Numan and three nearby towns, seizing US-made anti-tank TOW missiles. Division 13 was among the first rebel groups to receive US-made BGM-71 TOW anti-tank missiles, as well as western training. A rebel alliance headed by Al-Nusra and Islamist faction Ahrar al-Sham captured full control of Idlib province last year. Al-Nusra has previously attacked other factions who have received support from the United States. In the summer of 2015, it kidnapped several members of US-trained rebel group Division 30. In recent weeks, tensions between Al-Nusra on one side and non-jihadist groups and activists on the other have boiled over. On Friday in Maaret al-Numan, motorcyclists waving Al-Nusra's black flag tried to take over a peaceful protest in the town square, shouting "Allahu akbar" or "God is greatest". Four days earlier, the group threatened to fire on anti-government demonstrators in Idlib city.